Vector Displays wants you to stop worrying about your trade show freight. We specialize in trade show shipping and provide guaranteed, on-time delivery. 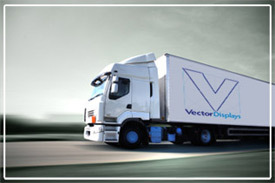 Vector Displays offers affordable shipping, whether you’re shipping a case, a pallet, a crate, a partial trailer load, or a full trailer load. Click to learn about Vector Displays' trade show project management services. Why should I use a trade show freight carrier instead of using UPS, FedEx, or another common carrier? A trade show freight carrier provides point-to-point shipping of your booth with minimal handling, which minimizes the chance of damage. The overnight services handle many other shipments along with yours, and even with their money back guarantees, if your booth is not delivered on time, what good is your refund if you have no booth when the show opens? Common carriers usually take your shipment to a central distribution point in your area to reload and consolidate it with other shipments. They then deliver to the destination centerï¿½s distribution point, unloading and dispatching it to the final destination. Unfortunately, this delivery system creates multiple opportunities for damage and loss.